Cafe tapas Hervey Bay is a fabulous way to start off a night with a friend or a light lunch, or a huge feed if the mood strikes. The diverse menu has over twenty tasty tapas on offer from the succulent duck crepes to the crispy san boi chow lettuce cups with minced pork and noodles. With funky decor and the choice of low couches or regular tables, the glowing walls and chandeliers set a warm atmosphere with a busy and friendly bar. One of the most stylish bars/cafes in the region, you can choose to eat as much or as little as you like. Choose a single dish for only $7 accompanied with a cocktail for a cheap meal leaving plenty of left over cash for the rest of the evening. A food lover who can't choose a taste? Try them all. 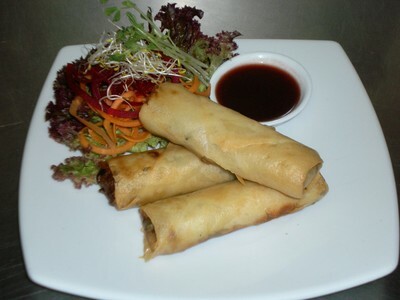 The King Prawn spring rolls is a personal favourite with a crispy shell of pastry. The satay chicken skewers are tender and not too salad and the pumpkin salad is the perfect balance of vegetables and dressing. There is plenty of space for birthday bookings or in our case, a hen's party and the staff are happy to take all your orders at once or one at a time, so you have a seemingly endless array of bowls and plates delivered to your table. Tapas means a wide variety of appetizers in Spanish. Cafe Tapas is influenced by Asian recipes more so than the taste of Spain found at most tapas restaurants. Located on the touristy Esplanade strip, you can roll your night out into one venue at cafe tapas with great food, the liveliest atmosphere in the Bay and tasty cocktails. Cafe Tapas is also open for lunch so you can drop in for a memorable lunch following a lazy walk along the beach. Indulge in a vast array of tastes at Hervey Bay's leading restaurant, Cafe Tapas. 417 The Esplanade. Phone (07) 4125 6808. Sounds great thanks for the review. Have to check it out on my holiday ! I have been there too. Great food!